From one of the worlds oldest paper makers comes this maximum high textured, 100% cotton rag fine art paper. 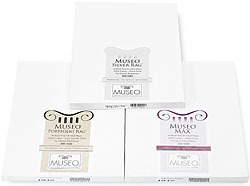 Originally introduced by America's premier maker, Crane & Co., Museo® MAX set the standard by which all past and future fine art papers will be judged. Combining breakthrough coating technology with the finest ingredients including the world's leading cotton paper know-how, this paper is sure to wow your clients.